LACTO-5® - Why locally derived probiotics? LACTO-5® GOLD Complete Gut Nutrition. 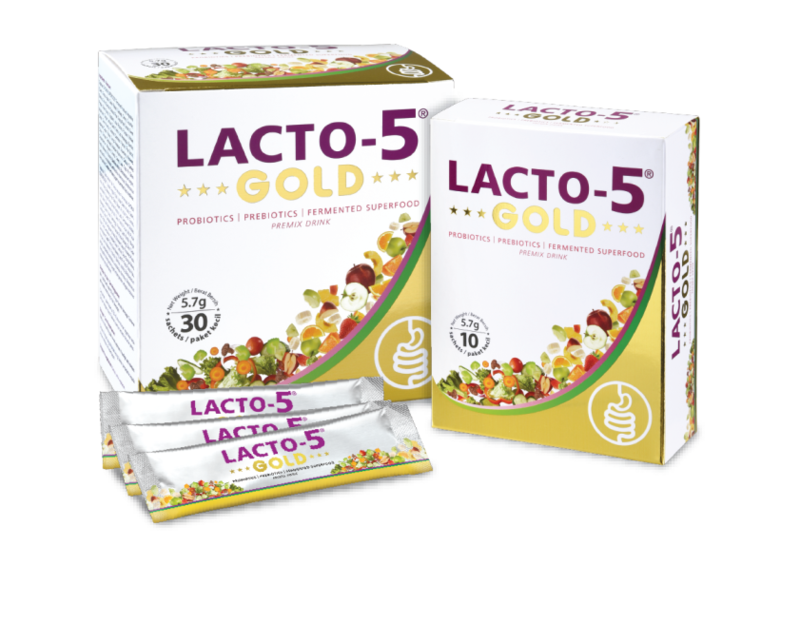 LACTO-5® GOLD is a complete gut nutrition that combines the trusted benefits of Locally Derived Probiotics with the Japanese goodness of fermented Ohtaka Superfood™ and enhanced with Tagatose Prebiotics from Korea. It provides a balanced macrobiotic nutrient environment for gastrointestinal tract. Helps in relieving the symptoms of gastrointestinal problems. Increases the growth and maintenance of beneficial bacteria. Helps in the production of enzymes in our digestive system. Provides maximum nutritional values from 50 types of fruits and vegetables. As Malaysians, we love our local food, but so do the bacteria living in our intestines. Locally Derived Probiotics are better adapted to our local diets to provide optimal benefits to our intestines. - isolated from Malaysian sources that will survive better and longer in our intestines. - protect the friendly bacteria while as it passes through the harsh conditions of the stomach and into the intestines where it can germinate and grow. Live friendly bacteria of up to 10 billion CFU. - allows the friendly bacteria to survive with NO refrigeration required. A proprietary blend of the world's 50 healthiest fermented fruits and vegetables that is beneficial for our digestive system and also maintaining a healthy body. "What has life in it must eat what has life." A "living" diet rich in fruits and vegetables aids the growth of friendly bacteria in your digestive system. Sourced from Hokkaido, Japan, Ohtaka Superfood™ contains 50 types of fruits and vegetables that were fermented for 6 months using top-notch Japanese technology to create a superior blend of thousands of phytonutrients. This slow fermentation process breaks down the fruits and vegetables so that the plant nutrients normally resistant towards digestion can be liberated to nourish and restore the human body. Provides the maximum nutritional value of superfoods by 'unlocking' the valuable nutrients with the ancient power of fermentation. Aids in the production of digestive enzymes in our digestive system. A uniquely healthy and partially digestible sugar imported from South Korea that is works as an excellent low-calorie natural prebiotic derived from whey. It is 92% as sweet as table sugar but with only 38% of the calories. It has a very low glycemic index of 3. The ingested tagatose will be broken down into short-chain fatty acids (SCFAs) by friendly bacteria which lower the pH in the large intestine. A low pH suppresses the growth of bad bacteria in the large intestine.SCFAs also acts as a fuel and protective agent towards the epithelial cells of the large intestine. Promotes the growth and maintenance gut bacteria in our digestive system. Improves the adhesion of probiotics to the intestinal wall. Has a low glycemic effect.